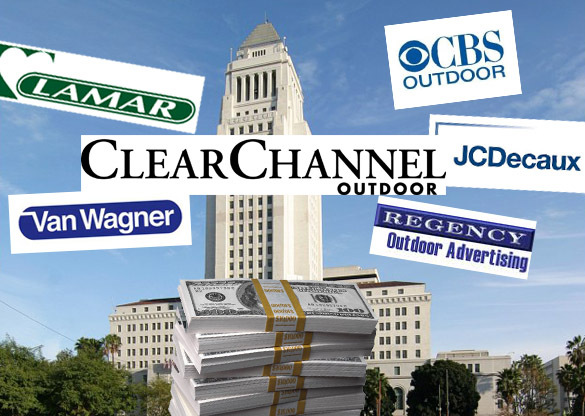 Clear Channel, CBS Outdoor, and other billboard companies spent $2.8 million lobbying Los Angeles city officials in 2013, according to City Ethics Commission reports. That’s more than double the $1.2 million spent by those companies in 2012 to influence City Council members and other officeholders. Clear Channel, the perennial leader in the lobbying parade, wrote checks totalling $1.068 million to five different firms registered to lobby City Hall. Other major spenders were JCDecaux, with $446,000; and CBS Outdoor, with $398,000. Clear Channel and CBS have been pushing for a deal with the city to allow their now-dark digital billboards to be turned back on, while JCDecaux holds the advertising contract for LAX.